Salads are not only sliced vegetables seasoned with oil. 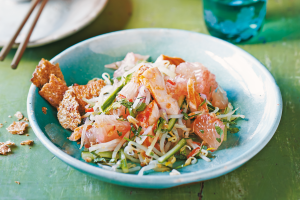 Salads may be different: vegetable, fruit, meat salads, from seafood. Also, salads can be not only from raw vegetables, but also from cooked or baked. 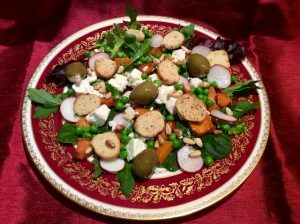 Vegetable salads are rich in useful micronutrients and vitamins and therefore occupy an important place in the menu of everyone who tries to keep to a healthy lifestyle. Combining and changing the ingredients, you can get a new healthy salad with a new taste every time. 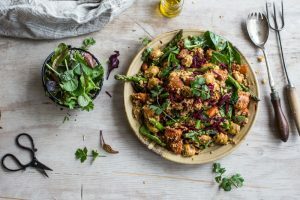 Add vegetables, legumes, chicken, fish, seafood to salads – sticking to a healthy diet with salads is much easier with the collection of the best recipes. 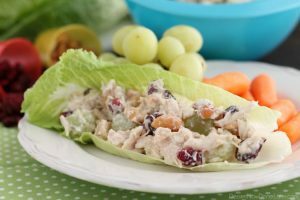 A light salad with chicken and fresh vegetables is a delicious dish that is convenient to take with you, in a hermetically sealed container, and eat as a snack at work . The recipe for making a salad is simple, the ingredients can be changed to suit your taste. Prepare the sauce: mix lemon juice and olive oil, add salt, pepper and herbs (basil, oregano, provencal herbs, thyme) to taste. Rub the chicken fillets with salt and spices and fry on both sides on the grill pan until they are cooked. Cut the sweet pepper into small pieces, drain the beans and corn, cut the cherry tomatoes in half. Cut Feta cheese into cubes. Advice: Prepare two cans in which you will put your salad- add all the cut ingredients in layers in the random order. Put some arugula and pour over the prepared sauce. Useful properties of beet, its special nutritional value are associated with two points. 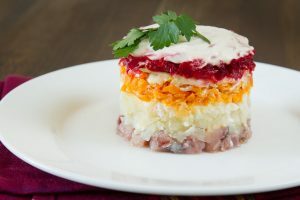 Firstly, it is a unique set of elements that is not found anywhere else, and, secondly, the beet contains a large number of substances that are not prone to destruction during temperature cooking. The use of boiled beets does not cause any doubt. Cut one onion into cubes and fry in a frying pan in vegetable oil until it is transparent. Add the diced mushrooms to the onion, mix, add 1 tsp. salt and fry until done. Cool it down. Peel the beets, cut into cubes. Finely chop the second onion, chop the garlic and add to the beetroot. Combine beets and cooled mushrooms, add balsamic vinegar, sugar, salt and mix. Advice: Salad with beets and mushrooms will suit any garnish or can be served as an independent dish. Many micro and macro elements necessary to maintain important functions in the human body make pumpkin seeds the best one in many indicators. For example, phosphorus in pumpkin seeds – 1233 mg (in 100 g). And this is provided by our body by 153%. Slightly less is magnesium (592 mg). This is 148% of the daily allowance for an adult. But all records are broken by Manganese. Only 50 grams of dry seeds provide this component by 100%. Cut cabbage and put in a large bowl. Cut the carrots, figs, mint, parsley and add them to the cabbage. Heat a frying pan and a fry pumpkin seeds on it. In a bowl with vegetables, add the sauce and seeds, mix everything thoroughly. Advice: Include this salad in your ration and you will be able to improve immunity. Salad with Chinese cabbage is more delicate and delicious than with the white cabbage, because it has more juicy and delicate leaves, they are more pleasant and more refined. This advantage is much more noticeable in winter and spring, when the white cabbage becomes dryish. 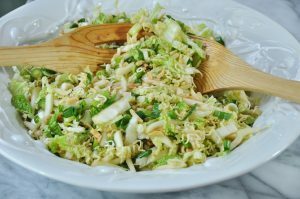 In the salad with Chinese cabbage you can add various ingredients with which it easily “makes friends” – this is meat, poultry, fish, and seafood. Other greens, nuts and mushrooms will not be superfluous. The composition of Chinese cabbage includes the alkaloid lactucine, which improves metabolism and normalizes blood pressure. Due to the high fiber content, this cabbage improves digestion. The natural mineral complex removes from the body excess fluid and cholesterol, promotes the splitting of fats. Wash cabbage, wipe it and cut into large strips. Clear squid of the film and cut into half rings. On a well-heated frying pan in vegetable oil fry squid, add mushrooms and fry to them for 5 minutes to leave the liquid. Add Chinese cabbage to the pan and fry, stirring. Pour sesame seeds into the frying pan, add soy sauce, stir, add spices and salt to taste. Advice: Take the salad with the cabbage from the fire, put it in a plate and serve it warm. This salad has a lot of vitamins thanks to honey, which is helpful for the immunity improvement as well as cranberry. which is rich in vitamins, pectic substances, organic acids and sugars. In a large bowl, combine the persimmons, greens, dried cranberries and mandarin slices. Then add sliced small pieces of mozzarella, nuts and seeds. Advice: Cook the salad dressing in a separate container. Mix the juice, balsamic vinegar and olive oil. At the end, add salt and pepper to taste. Related: How to get rid of unpleasant fruit flies easily. Carrot is rich in vitamins of group B, vitamins C, E, K, and also contains beta-carotene – a substance that in the human body turns into vitamin A. It contains trace elements of iron, iodine, cobalt, copper, manganese, molybdenum, fluorine, zinc; necessary for our body macroelements of potassium, magnesium, calcium, sodium, phosphorus. An apple is by right called the fruit of health as it contains a large number of vitamins such as C, B1, B2, P, E, including manganese and potassium. It is also one of the easily digestible sources of iron. Apples are used not only for the prevention of colds, but also for the treatment of severe ailments as malignant formations. Grate apples without peel on a large grater. In a small bowl, combine honey, natural yoghurt, salt and pepper to taste. Season the salad with the sauce and stir. Advice: Serve the salad to main dishes and you will avoid problems with health during the flu season. Herring is a valuable source of quality protein, without which the body is difficult to repair damaged tissue, and it is normal to function as well. It has a lot of vitamin B12 and D, omega-3 fatty acids, minerals (selenium and iron). All these substances are involved in the metabolic processes of the body. The herring is also rich in substances such as phosphorus and potassium, calcium and iodine, sodium and fluorine, magnesium and zinc. Herring contains vitamins A, PP, D.
Finely cut one small onion into half rings, put in a bowl and pour boiling water with vinegar in a ratio of 1: 1, so that the onion was completely covered. Leave for 1 hour. Add natural yogurt, slightly salt and add pepper to taste, mix. Finely chop the herring and lay out the bottom layer. Lay the pressed marinated onion with the second layer. Cut the avocado into cubes, lay on top of the onion. Cover the layer of avocado with a thin layer of yogurt. 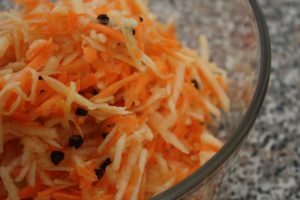 Boil carrots, peel, grate on a fine grater and put on top of yogurt. Soak gelatin in a small amount of water and leave for 10 minutes. Boil the beet, peel and grate. Add 2 tsp. of natural yogurt and blend mass with a blender. Gelatine is dissolved in a water bath and added to the beet, mix well. Lay the beet mousse with the last layer and put the salad in the refrigerator. Advice: After 30-40 minutes you can serve a salad to the table. This citrus fruit pomelo is very useful due to the large content of vitamin A, C, B vitamins, phosphorus, calcium, sodium, iron, limonoids and essential oils. In addition, this fruit contains a lipolytic enzyme that helps our body to break down fats and proteins faster. It is also rich in fiber, so it has a beneficial effect on the stomach and intestines. With the help of the potassium contained in it, the activity of the cardiac system is maintained. Take a very large cucumber. Take pomelo fruit and cut it into small pieces. As a rule, pomelo can be easily disassembled without losing its juice. Send the pomelo to the cucumber. With corn, merge the juice and add to a future salad. Mix everything. Add salt, pepper to taste. Let the cooked chicken fillet cool. Add chicken to the salad. Stir, season with soy sauce. Put the salad leaves in the salad bowl. Advice: Include the salad in your ration more often especially if you have any problems with stomach or heart. 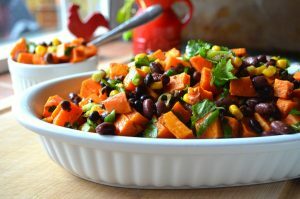 The main advantage of beans is the ability to receive vegetable protein contained in them in large quantities, which is especially important for those who for some reason do not eat animal products. In addition, in the beans there are vitamins PP, C, B, amino acids, enzymes, carbohydrates, carotene, potassium, sulfur, phosphorus, magnesium, iron, calcium, pectins, purines, fiber. Caloric content of beans is 340 kilocalories per 100 grams. Boil the beans until they are ready. If the beans are very young, then they should be cooked no more than 7-8 minutes from boiling. Drain, cool and clean the shell. Cut pepper into large cubes, finely chop chives. Prepare the sauce: stir the honey with soy sauce and wine. Advice: To reduce cholesterol, it is enough to eat 100-150 grams of beans a day. The state of the vessels often improves after 2-3 weeks of regular use of the beans. 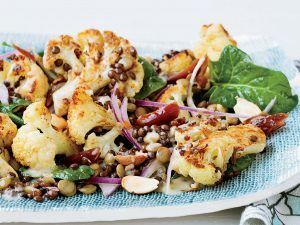 Cauliflower is a good source of nutrients, minerals and vitamin. 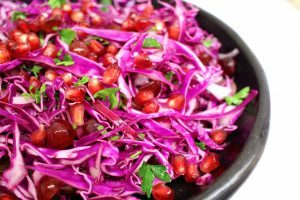 In comparison with white cabbage, it contains much more proteins (about 1.5-2 times), vitamin C (ascorbic acid (approximately 2-3 times), and this vegetable is saturated with vitamins B6, B1, A, PP. It is also rich in tartronic acid, citric acid, malic acid, pectin. Cabbage has a very rich biochemical composition, it is an indispensable food that provides valuable healing properties. There is evidence that cauliflower strengthens the walls of blood vessels and removes cholesterol from the body. Carcase of squid – 1 pc. Boil the purified washed squid carcass (lightly rubbed with salt) and the cauliflower inflorescence into a pair. The time for steaming is 15 minutes. Put cauliflower in a salad bowl. Cut squids into small, arbitrary shape, pieces. Add to the cabbage. Cut the onions in half rings, add to the salad. If want, the onion can be scalded or used pickled. Add salt, pepper and season with olive oil. Stir. Add to the salad bright colors (carrots, parsley). Advice: Cauliflower salad must be included in the diet of those people who want to get rid of excess kilograms thanks to its property to prevent the formation of fatty deposits. How to take care of shoes so that they look like new ones longer?